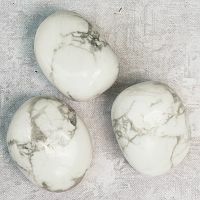 - A set of three tumbled howlite gemstones. Stones will vary in size and shape, but most are in the range of 1/2" to 3/4". 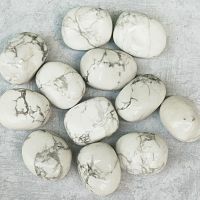 The gentle, soothing energy of howlite is an excellent antidote for stress, insomnia, and anger. It helps to quiet racing thoughts, allowing better focus and self-control. Do you have any other questions about our Howlite?